Seong Eun Kang and 7 participants. - This show is not an exhibition per se but like a station. - It has movement. I saw this many times. But there’s no end. Video works usually have designated duration but this show doesn’t have a running time. There is still an afterimage even after I get back from grocery shopping. - That’s what painting is like. These days paintings are too iconic and too precise so there are increasing number of paintings that you can describe in one word but they don’t last long. I think classic is harder than avant-garde. Not retro or nostalgia but concentrating on classic. - It’s hard because we keep trying to verbalize it. There is something clear when we see her works. Titles of exhibition focus not on contents but on substance. The contents say ‘other’s place’ but it’s just too overwhelming to talk about contents so when we say ‘Pencil Classic’, it limits the range of the things we can talk about contents. - People should remember there has been ink stick before this exhibition. Pencil is a substance that fills more plane and also sharper, and that’s the reason behind the title. Seong Eun Kang, Before Mountains, Pencil on Paper, 54x78 (cm), 2011. - What about you? How is it? - I like it because I feel the breath. There’s no person in it. It looks like a sausage at some point. If this could been shown in other places, if the spacing between pieces were different, everything would have been very different. Is this the same place? - Kang: No, I shot and drew in three different locations. I took a walk in a ski resort at night but there was this strange light coming at me and I was too scared to go on. So I took some pictures and got back to my room and started to draw. - But this is too much work. I’m wondering how long this can go on and worried about the artist. - After the first private exhibition, I used ink stick for a year and ten months. After the exhibition, I thought I wouldn’t have to draw houses the same way so I tried to get away from that kind of a platform for those year and ten months. I drew everyday but I feel like what I had worked for a year and ten months has gone away altogether. Looking at a four-month’s work making an exhibition I had somehow felt vain. There were many turning points along the way. Discovering a scene at a ski resort, working at a drawing workshop and what not. - My belief system has changed. Because of those four months. I did a class called ‘Drawing Workshop’ for nine years but I didn’t teach drawing. Because I didn’t believe in drawing. I didn’t think I could teach students what I think isn’t valid. But through those four months, there was this ‘Could we do it?’ ‘Shall we?’ momentum. These fellows each showed a sudden moment of change. Drawings are very honest that you can see the change at once, and you can go on to the next step. I drew mostly for recording stuff but when I keep drawing I don’t choose words but naturally go on to the next stage. I came to know this is why people draw. After that, my pre-existing denial against drawing didn’t matter and I came to believe that drawing is necessarily solely for myself. - To talk about the space of the exhibition, I’m coming to see an exhibition and after myriad of alleys I go into this residential home. Do we have choice but to cover up when the exhibition is at a residence? Is it because they are works on paper? I’m curious how this could benefit compared to exhibitions in galleries. - Galleries are usually not so private, so they frame each piece to show. We can’t show this way. Problem of maintenance directs to price, and the problem of audience. - I still hold the possibility to show them in other places so I left the margins of the drawings. - I think it would become too difficult if we put glasses over these drawings. - I’d like to write about Kang's drawings. - You want to write? - What kind of writing? About a journey? - I don’t know for sure, but since I’ve seen the process and all. - I like the interesting points amateurs make when they write. Writings that are not tainted by a critic’s eye. - I think this exhibition is more generous to the audience. Besides any critical aspects, artists give much to the audience so they can easily say good things. - I tried to restrain myself from being too effusive in drawings before but with this work I had somehow let go of some of the emotions. - I think that’s because pencil is a calm tool. Ink sticks are sticky. H pencils are even calmer. - Groundless affirmation in drawings or others works is boring. - I’m too careful to talk about art works, I pick up words very carefully. I praise each artist I show groundlessly; it’s not groundless but I’m genuinely surprised and touched. - Are you surprised about the craftsmanship? Or about the time she spent on the drawings? - Impression comes before craftsmanship. I’m deeply moved a second before I think about craftsmanship when I’m faced with her drawings. It’s hard to compare but there was this very black painting by Sung-shik Moon from Kukje Gallery. - That big, black painting with ink shows some kind of asceticism like, ‘I drew for a very long time and I drew it hard’, but that was just about it. - Was that because it was at Kukje Gallery? I really wanted to see it that but the lighting was too dark to see. What if that was shown in this place? - Thinking artists’ methods or craftsmanship is like the third of importance for audiences, when it comes to painting or drawing. First comes impression the instant when you look at a piece. I always say I like Seong Eun Kang’s drawings because they always give me new inspiration every time I see them. On the other hand, when I look at Sung-shik Moon’s painting I thought about craftsmanship first, imagining it would have been so hard to draw that but this kind of reaction from audiences is almost like a failure to the artist. First thing that comes when you see a drawing/painting should be that overwhelming feeling. - Yes, that painting doesn’t give you that. - I wished there were no pencil trace so I tried very hard. There are countless pencil lines. If I could have seen pencil traces people would be thinking about craftsmanship. - This is what I think. What’s classic is that universal, timeless common ground that everyone face one or the other through their lifetime. Everyone would have the experience of passing by somewhere without a light of civilisation. That’s timeless. And it’s easier to accept than the moments of asceticism. Classic is like that. It’s proven by history and it has some authorised dignity. - Here’s what. When I see someone believes steadfastly even though I keep doubting, there is something soothing about it. I saw faith in modesty that doesn’t dare to doubt. - Are you like that too? Do you doubt about drawing? - I’m like that not only about drawing but about everything else. - I had never doubted about drawing. - I’m a person with too many doubts. I had never done anything without a doubt. - I didn’t believe in craftsmanship when it comes to drawing. It almost felt sinful. People usually dive into art with that groundless fond of drawing. I would get over with drawing as fast as I could, just as I would get over with wrong things or as I would wipe myself in toilet. But after this drawing workshop, everything turned over. I had become mellow and craftsmanship of drawing became to make sense. I’ve been denying the encounter of art and asceticism. But there was this nonsensical moment when I became to believe perfectly, looking at others draw. I thought I would never compromise. When I was little, I would draw endlessly and my mom threw away piles of sketchbooks every year. But when I came to know about contemporary art and learned that art world has something to say, something to speak up I stopped drawing because I felt I first need to make sure of what I need to say to choose drawing. But in fact, the problem was that I couldn’t believe in it. 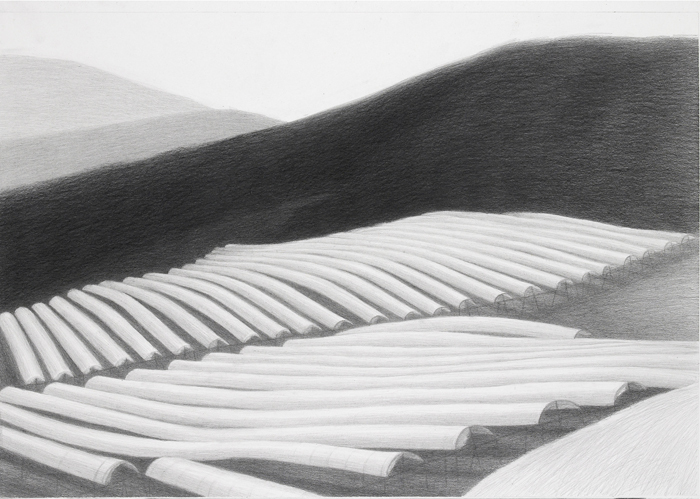 Seong Eun Kang, Night Fin of Mountain, Pencil on paper, 39x108 (cm), 2011. - What’s it like to hang the drawing? - Drawing a night, I think I discovered some kind of possibility. - This is too much pain in the arm. - I can’t go just with drawings, and I can’t organise my thoughts in what to draw. It took too much time drawing a house. - Because you couldn’t wrap up? - I had learned something about drawing, little by little for each drawing. - Do you think that subtle change in millimeters is needed for artists? Or for the art world? - There was a drawing piece that Clemens Krümmel showed in class. Subway’s surveillance camera is black and white and has twenty-five frames a second. And you draw the frames over and over. What would happen in a subway? When you look at them, they are all same twenty-five drawings. Clemens said ‘nothing is repeated’. First of all, time has physically passed. He was an artist who drew the image of a public space through a surveillance camera immensely, almost foolishly. Process is vastly slipping away, and what is this guy thinking he had drawn, I thought. - So you think that subtle change is necessary? That repeated situation, the acknowledgment of it, is that needed for everyone? It’s a fundamental question for an artist. Do we need it? And the other thing is this. The word classic stays the same the next day. Of course, you can develop a thought for the word. Drawings and the process of drawing is different; on the next day, nothing is repeated. Many other things the next day. It’s not because it’s complicated but because you’re solely concentrating. You’re not confusing people but put in order the thinking process in various ways. It’s necessary for an artist. But who else needs it? That’s why I closed the door. I’m just going to do myself. An artist needs a time to close the door, without borrowing language, to go on to the next stage. - The meaning of ‘nothing is repeated’ doesn’t matter when it’s not present, but it becomes important when it does present. - To reach that subtleness, blood should flow well in arteries and reach to capillaries. It’s good enough to do well in arteries. Reaching all the way to capillaries is just racking a life. What I’m wondering is would everyone feel the importance of capillaries? Would they perceive the same way? - I had decided video as a medium and really, I went to countless exhibitions. There were artists like Douglas Gordon, or like film directors but there weren’t so many drawings. There were works by Nancy Spero and they were numerous drawing works that you would drool over. That exquisite quality leads to approval. Of course, the feminist discourse helps that approval. But just the ravenous quantity of them was over the top. It’s different from Seong Eun Kang’s show. The temperature of the drawing is different. - The temperature is important in Seong Eun Kang’s work. She tried works that betrayed the ink temperature even when she used ink. One thing I’m wondering is drawing itself, how to draw, how to express, is it included in the genre of painting? A part where painting is classic and pure. So I think there are two ways in drawing. Showing ideas as fast as it could, and the performance of that moment, if there is something like ‘no skill’, and when you go into illustration part, just as the story of that frames in the subway, you see narration or statement. And the kind of drawing, the kind of painting that this show is disclosing. If you experience some kind of liberal opening of mind through the drawings, that could be an experience pertaining to painting. This isn’t theatrical or anything but the moment itself. It shows every moment and every part very precisely. That’s what’s scary about pencil drawings. That’s why they train you with pencils for the college entrance. - The important thing is that we are only few but we waited for the works to be completed and to nourish ourselves. Art often threatens us, worries us, and makes us deprived, but this show gave us moments that come rarely. That’s why I remember those moments.